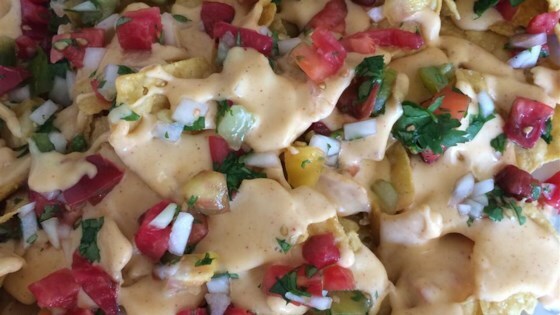 "This nacho cheese sauce recipe is not cheaper and easier to make at home, but what you lose in cost and quantity, you more than make up for in actual food content." Melt butter in a large pot or Dutch oven over medium heat. Sprinkle in 3 tablespoons plus 1 teaspoon flour. Whisk constantly until the mixture is thick and all the flour is incorporated, 3 to 4 minutes. Slowly pour cold milk into the butter mixture, whisking constantly until combined. Simmer, stirring occasionally, until slightly thickened, about 5 minutes. Stir in paprika, ground chipotle, ancho chile powder, cayenne pepper, and salt. Reduce heat to low and add sharp Cheddar cheese, Monterey Jack cheese, and Muenster cheese, a handful at a time; stir until thoroughly melted. Season with salt to taste. See how to make a cheesy game day classic. It’s easy! Test the dip with the chips you'll be serving them with, since they will affect how much salt you need to add to the dip.